Everyone seems to have an opinion on The Pawn and it is fair to say that that opinion is not always complementary. In light of that, it was with some trepidation that I went there to catch up with a friend for Sunday lunch. Much to my surprise, I had a great meal. Struggling slightly with a hangover from E.'s birthday bash, I decided that the only possible option on the menu was fish'n'chips with peas and homemade tartar sauce. Perfect to cure any hangover. 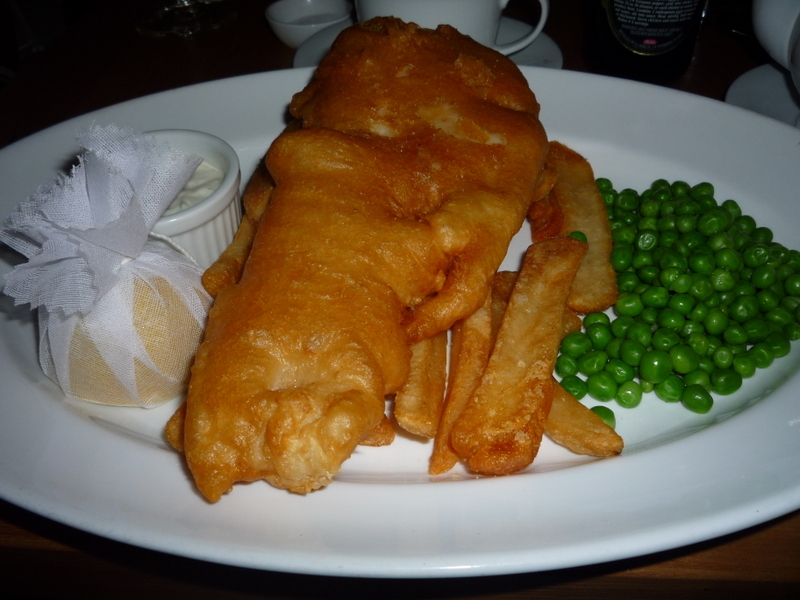 I'd seen a photo on the internet which made it look like they served really small portions so I was very surprised when a generously sized piece of fish arrived. The fish was beautifully cooked, the batter really crispy. As vitamins were also part of my cunning hangover cure strategy, I ordered a side of green beans and beetroot. The cold dish was great, really fresh and simple. My friend L. ordered the pumpkin, asparagus, roasted tomato, rocket and parmesan risotto which looked good - apparently, just like it tasted! I was completely torn on the pudding front because I am absolutely obsessed with stilton and they had stilton and oatcakes on the menu. However, from a hangover point of view, I decided sugar was needed so the apple and rhubarb crumble with English custard was an obvious option. The crumble was quite sugary sweet although the tartness of the rhubarb counter-acted it to some extent. I would have preferred more custard than was provided, partly because it would have helped the hangover but particularly because that would also have helped make it less sweet. Other than that, it was a good crumble. It's not cheap pub grub and as L. said, it probably wouldn't stand up to some of the London gastropubs but it is nice food in a brilliant setting. The decor of the restored building is really arty and interesting, and given Hong Kong's propensity to knock anything vaguely old down, it is great to see the restoration of a building dating from 1888.